Welcome to the June 2017 issue of the AXIe Newsletter. 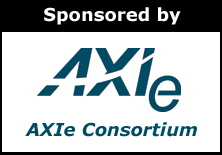 Our AXIe Consortium LinkedIn membership numbers continue to increase and we are now a community of over 345 members. If you want to stay abreast of the AXIe standard you can subscribe to the new AXIe consortium YouTube Channel, or view the latest AXIe Overview presentation on the website. Visit http://www.axiestandard.org for more information. Today’s cellular systems are on their fourth generation of technology, labeled 4G LTE. While 4G continues to be enhanced, communication vendors, researchers, and regulators are busily defining, designing, and prototyping the next generation technology, simply called 5G. The goal is to bring an order of magnitude speed improvement, achieving in excess of 1Gb/s to the handheld. To achieve these speeds, researchers are looking at much higher frequencies, where spectrum is plentiful, but propagation is unwieldy. Consider that today’s LTE bands are constrained to 3.4GHz or lower, with some effort to extend that to unlicensed spectrum on the 5GHz Wi-Fi band. Now consider 5G. Trials are active at 28GHz, with research to nearly 100GHz. Spectrum allocations may be as wide as 2GHz, wider than the spectrum of all current cellular bands combined. This spectrum is often referred to as millimeter wave (abbreviation mmWave), since wavelengths are less than 1cm above 30GHz. What is there not to like? In part 1 of this series, Larry Desjardin asked, ”What are the business drivers of the end user that compels them to spend billions of dollars of their hard earned money each year on test equipment?” In part 2, Larry looked specifically at the financial drivers in R&D. Today in part 3, Larry looks at the financial drivers in manufacturing, and how those drivers lead to interesting preferences for manufacturing test equipment. While R&D is focused on getting the design right, manufacturing is focused on getting the production parts and processes right. After all, if all design defects are found and resolved in the R&D phase, all products created in manufacturing should function and meet their specifications when properly assembled. Test is only needed to tune the product or to detect a defective part or process such as a damaged component, or a wave solder short between adjacent pins. Military radar and EW systems must be exposed to signal environments as representative as possible to those they will ultimately experience, and this work should begin early in the design process when it’s most cost-effective. Only by meeting these two criteria can designers be reasonably sure that their final design will deliver its desired performance in the exhaustive (and expensive) range tests that follow. The Giga-tronics Real-Time Threat Emulation System (TEmS) was created to make this achievable as a COTS-based bench-top emulation system. This modular approach allows the system to scale with individual modules rather than through addition of expensive stand-alone instruments. Mobile Industry Processor Interface (MIPI) Alliance standards used for hardware and software interfaces within mobile devices (smart phones, wireless-enabled tablets and netbooks) are a benefit to the mobile industry because they enable reuse and compatibility in mobile device development. Engineers are able to use the standards as guidelines during product design, and can rely on vendors to provide components that also conform to the interface standards, which in turn, ensures that their products interact properly with other MIPI conformant devices.